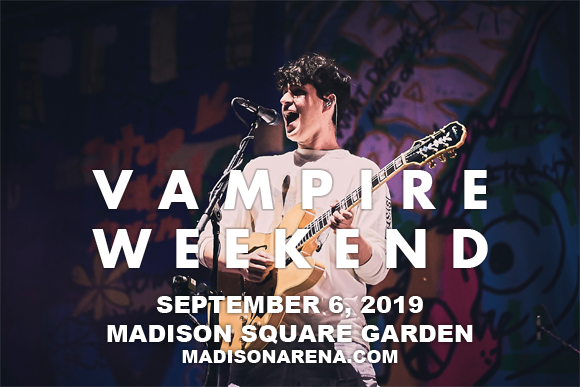 Jangly, percussive, globally-influenced indie-rock catapulted Vampire Weekend to stardom back in 2008 and now, the trio comes to Madison Square Garden on Friday 6th September 2019 to promote the release of their eagerly-awaited fourth studio album! The album, dubbed Father of the Bride, is their first in six years and is the perfect continuation of their friendly, danceable sound! Tickets available now! Ezra Koenig, Chris Baio, Chris Tomson are Vampire Weekend. The trio, and former member Rostam Batmanglij, met in 2005 at Columbia University in New York City and formed the indie rock band one year later. The group's eponymous debut album instantly charted in the top 20 of the Billboard 200 and went on to be certified platinum in the UK and US, and gold in Australia and Canada. Their second and third studio albums were even more successful with Contra (2010) reaching number-one on the Billboard 200 and Modern Vampires of the City (2013) winning the group a Grammy Award for Best Alternative Music Album in 2014. Father of the Bride, Vampire Weekend's fourth studio album, will be released in 2019.